Teenagers could be banned from Ellsworth Drive and other public spaces in Montgomery County under a proposed curfew. Yesterday, Montgomery County Executive Ike Leggett proposed setting a curfew on teenagers under 18, raising concerns about how young people are treated here and around the country. Expedited Bill 25-11 (pdf) would bar minors from being in public in Montgomery County after 11 pm on weeknights, and after midnight on weekends. Exceptions would be made for young people coming home from work, attending a school or church activity, or those accompanied by a parent or other authorized adult, and anyone caught breaking curfew would be taken to the nearest police station. While it's true that curfews in other cities have sometimes successfully reduced crime (pdf), many feel they are unnecessarily restrictive and discriminatory against teenagers. They also don't address what may be the root cause of teen crime, which is a general lack of things to do. After dark, there isn't much to do in Montgomery County after dark, which contributes to the problem. Many of the county's movie theatres and bowling alleys have closed in recent years, so teens often end up in urban areas like Rockville Town Center, downtown Bethesda and downtown Silver Spring, where some of them get into trouble and harm others. If there were more legitimate nighttime activities for teens, that would deter some of the illegitimate activities from happening. Parent groups often organize post-prom parties to deter drinking after school dances. Perhaps the Recreation Department or other organizations could set up similar events on other nights. 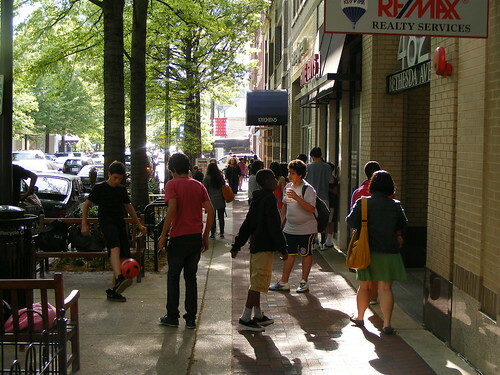 Teenagers play ball on a sidewalk in downtown Bethesda. It's unclear whether a curfew in Montgomery County is actually necessary. Though Leggett's spokesman, Patrick Lacefield, claims that Montgomery has become a magnet for gang members coming from the District and Prince George's, police statistics show that youth crime in the county is decreasing. The number of youth under 18 arrested each year has been steady for the past ten years and, in fact, fell for most of the decade. Meanwhile, the number of juvenile offenses recorded each year has fallen by 36 percent since 2001. According to the Washington Post, gang-related incidents in the county have dropped by more than half since 2007. It could even be that the increase in public spaces such as downtown Silver Spring available to teens in Montgomery County may even be contributing to the decline in crime, since such places are effectively chaperoned by the general public. Cutting troublesome teens off from public spaces would only send them "underground" and out of sight. Whether or not the proposed curfew would be effective, it may also be illegal. Teen curfews have faced many court challenges, often finding them to be too restrictive. In 2007, the American Civil Liberties Union sued the city of Lake Oswego, Oregon on behalf of four high school students, stating that a teen curfew there "criminalizes all youth" whether or not they had done anything wrong. Two years ago, a state appeals court in California struck down a teen curfew in San Diego that had many of the same provisions as Montgomery County's proposed curfew, arguing that the ban was too broad to be enforced. 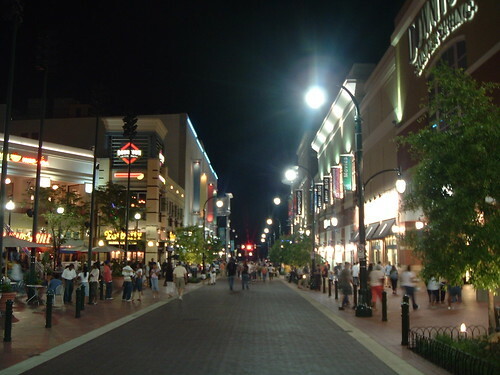 Creating more reasons to hang out in downtown Silver Spring can serve as a crime deterrent. There are better solutions. We can reduce crime and provide more activities for people of all ages in Montgomery County by creating more nightlife options in urban centers like downtown Silver Spring, putting eyes on the street and giving teenagers legitimate places to go. The Fillmore music hall, which opens this fall, will do just that, putting two thousand ticket-buying people on the streets multiple times a week. More housing downtown will also keep the area populated and patrolled after the diners and concertgoers have left. Teen curfews, like last year's county-imposed skateboarding ban in downtown Silver Spring, just punish all young people for the misdeeds of a few. What's next, mandatory summer school for everyone because a few kids flunked English? With crime decreasing and the possibility of judicial challenge, a curfew in Montgomery County is a solution looking for a problem. There are more substantial ways to combat crime and boredom, so long as we're willing to find them. The curfew bill goes before a vote by the County Council at a public hearing on Tuesday, July 26 at the Council Office Building in Rockville. For more information, check out the County Council website. Curfew verus more youth activities? I'm not going to take a position on this proposed curfew law. Safe Silver Spring will have a discussion at its next meeting, this Wednesday at 7:30 p.m. at the Long Branch Community Center. The public is invited. Safe Silver Spring has argued for some time for the creation of a youth center in downtown SS, specifically at the old library on Colesville Road. But it is naive to suggest that have some youth crime issues because a few bowling alleys and theaters have closed. We are now dealing with regional gangs who organize meetups via Facebook and Twitter. And the police metro-wide need tools to deal with them. We are calling for a regional summit on gangs. If there are problems with gangs, go after the gangs. Forcing all kids to go home after dark isn't the way to smoke out gang members. "Teenagers could be banned from Ellsworth Drive and other public spaces in Montgomery County under a proposed curfew." I find that to be a bit over the top. We're talking about getting kids off the street for 5 hours a day (midnight-5am), which is hardly intrusive or illogical. Use the $$ from fining absent parents to create more youth activities for the other 19 hours a day and it makes sense all around. Dan, your equation of 11pm or midnight with "after dark" is more than a little disingenuous. You argue fairly reasonably that curfews are a bad idea, you don't need to utilize this kind of hyperbole to underscore it. I haven't read the language utilized in the bill, but unless it has absolutely no exceptions (i.e., okay to be out as long as the minor is travelling to/from work, etc. ), I find it hard to get as worked up over these things as I did when I was younger. While there are certainly some aspects of minors' civil liberties that should be taken into consideration on these things, it's often difficult to counter the relatively reasonable argument that a) minors don't have a good reason to be out this late, and/or b) should be at home at this time of day. While it's certainly true that a good portion (a sizable majority, probably) behave well and are engaging in safe and legal activities while out in the middle of the night (not simply "after dark"), many are also "up to no good" as my dad used to say. As for a curfew being an effective tool in combating gang activity: is there any evidence at all that the majority of "gang activity" during these hours is actually being undertaken by minors? Many of the obvious gang members I see in the SS area seem to be well-past being minors. What's problematic here, IMO, is that the County is finding that it needs to act in loco parentis. Whether through a curfew or through finding 'constructive' activities for teens at night, these just aren't things that County government is really set up to do. I don't have a quick answer for what to do here, just noting that framing it as 'for' or 'against' curfews sort of misses the point. I want to add that in Maryland it already is illegal for 16 and 17-year olds to drive after midnight. We have numerous examples where government has passed laws to protect minors. Indeed, the progressive labor movement in this country in some sense began with the passage of child labor laws. I think not letting seven-year-olds work in factories is a little different than letting a high school student attend a movie that lets out late. Would you repeal the state law prohibiting their driving after midnight just so they could see a early-morning movie? Would you support a curfew at midnight on weekdays and 1 a.m. on weekends?Are you aware of the scientific research that shows the brain does not fully develop until after age 18? I'd like to believe that teenagers are smart enough to avoid risky behavior but experience and science suggests otherwise. As for relying on parental control, I remember being shown pictures of a house in Silver Spring where police raided a "skip" party of teenagers. The walls were covered with gang graffiti. I asked why the parent would allow this? I was told the mother feared getting beat up by her teenager. These are the exceptions but they are real. That party you mention represents a very, very small minority of teenagers in Montgomery County. How can you use that to justify something that punishes all youth? I know there are studies that say the human brain isn't fully formed until age 25, which makes me wonder: why are you reading my blog? I'm age 23, meaning that I must not be thinking straight. Teens do not need anything to do after midnight.During the weekdays they should be home(read about the lack of sleep many of our school age children swuffer from)The number of teenage driving deaths-- usually after midnight. I think most parents want their children home and safe at night-- . The city doesn't need to provide teenagers more options after dark, they should be asleep. They have exactly as many options after dark as an adult who doesn't drink does. Arguing that the city needs to build something special for teenagers still treats teenagers differently from adults, its just in a way you like more. The lack of sleep that several people have mentioned actually has a lot to do with the biological differences of adolescents, their developments, and brains. The circadian rhythms of adolescents are naturally driven to stay up later in the night and sleep through part of the day. In addition, regardless of WHEN they sleep, they require more sleep. Thus, there is a biological reason for adolescents wanting to stay up late and sleep in. Their bodies in a lot of ways are ideal for 3rd shifts. If the County shouldn't be involved in setting curfews, it shouldn't be involved in giving children government-sponsored activities to do. Teens need to figure out ways to entertain themselves like normal people do. Could there be more youth oriented activities in the area? Certainly, but many of those activities would be aimed at younger children as well. A youth center is not going to help this situation. The kind of knuckleheads plaguing Ellsworth aren't going to be caught dead at a youth center. Check that, that's probably how they will be caught there, after one of them stabs another. Whether or not violence is dropping doesn't mean that more shouldn't be taken. Drunk driving deaths have been dropping, that doesn't mean more shouldn't be done to eliminate more. That's illogical Dan, and you're hurting your own argument here. The best arguments that you can make here are centered around the effectiveness or ineffectiveness of curfews and the civil liberties issues this raises. Those resonate with people and are legitimate. If curfews are ineffective, I would never support one. I am also troubled by singling out an entire group/class of people. You will not win over people like me by arguing that we don't need to lower violence in the area. 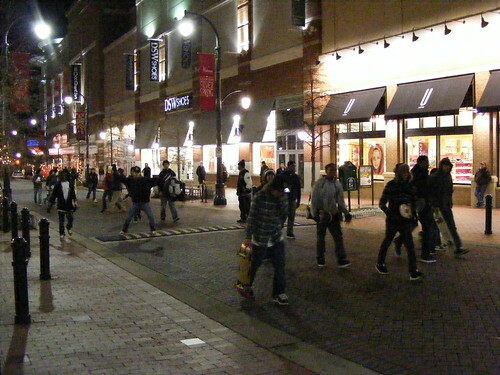 No one should be stabbed walking around DTSS. There are too many idiots loitering in the area, causing issues. That needs to be addressed. I never said I didn't want to reduce crime. But I do think that current policies are working if crime countywide has been dropping for the past several years. I don't really understand the hostility to creating a teen center in Silver Spring. This has been under discussion for years and a site has been proposed (the old Silver Spring Library). While it's unlikely that the "bad kids" are going to be hanging out at the teen center, it's still a good amenity to provide for everyone else. 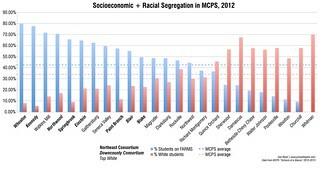 Whether you like it or not, young people are a presence in Silver Spring and Montgomery County. They pay taxes, and if they don't, their parents do. All of you were teenagers at some point, and all of you, I'm sure, occasionally stayed out late. Most of you were probably not criminals, as the overwhelming majority of teens in Montgomery County aren't criminals today. And there's no reason to punish all of the county's youth because of a few bad kids. I don't have an opposition per se to a tean center, but I'm not far removed from being a teen, and most likely I would have never gone to one. Someone is going to have to sell me on a lot more than A) "It'll give them something to do and B) It will keep them out of trouble. I need someone to sell me a vision of what this teen center will be, what it will try to accomplish, what its hours of operation will be, etc. You can't just build it and they will come. It has to be something that teens really want. I'm sure if you ask a group of teams if they'd like some amorphous team center, most would say yes. They can all form a mental model of their ideal center in their head. What I need to see articulated is a vision for an actual center, with actual programing, with an actual budget, with actual teen feedback. You're a planning student and can articulate quite well what you'd like in a building or a block. Can you or someone else paint a picture of what this teen center will be like? You're absolutely right. We should talk about what a teen center would look like and develop a concept that local teens would actually want to visit. I'm not sure what the Safe Silver Spring group's ideas for a teen center are (they originally proposed it, as Woody pointed out in the first comment in this thread), but I imagine it might look like the Columbia Association's teen center, housed in a converted barn. This whole circadian rhythms argument is very clever, but it doesn't really change the fact that kids have a legally mandated responsibility (ie school) during daylight hours and have to get up relatively early. Anyone can change their nature sleep patters with enough effort - teenagers need to because they need to go to school. Am I so old now that I think trying to figure out how to keep teens occupied at midnight on a weekend or during the week is seriously being considered? I'm relatively young and even I think kids under 18 should be home even before 10pm. IF they are going to a movie and it lets out late, a parent or guardian 25 or older should be there to pick them up. 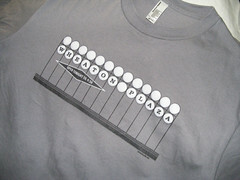 Old school says you need to be in the house when the street lights come on. I say kids need to head home when stores start closing at 9:30om. There is NOTHING to do at midnight on a weekday for a teenager in the suburbs. Go home! Play video game, or better yet, read a book. My argument doesn't disagree with the idea of the curfew or anything like that. It's just a biological explanation for why adolescents are more prone to those hours. Also, many school districts have begun restructuring their hours such that high schools start the latest and elementary schools start earlier. You can train your body to do plenty of things, trust me I know. However, there is something to be said for using the the uniform 6-8 hours of sleep at the exact same hours is what every person needs when clearly sleep studies show that is patently false.